Part 2 of the report presents findings through an industry and country lens, with the aim of providing specific practical information to decision-makers and experts from academia, business, government and civil society. Complementing the cross-industry and cross-country analysis of results in Part 1, it provides deeper granularity for a given industry, country or region through dedicated Industry Profiles and Country/Region Profiles. Profiles are intended to provide interested companies and policy-makers with the opportunity to benchmark themselves relative to the range of expectations prevalent in their industry and/or country. This User’s Guide provides an overview of the information contained in the various Industry Profiles and Country/Region Profiles and its appropriate interpretation. 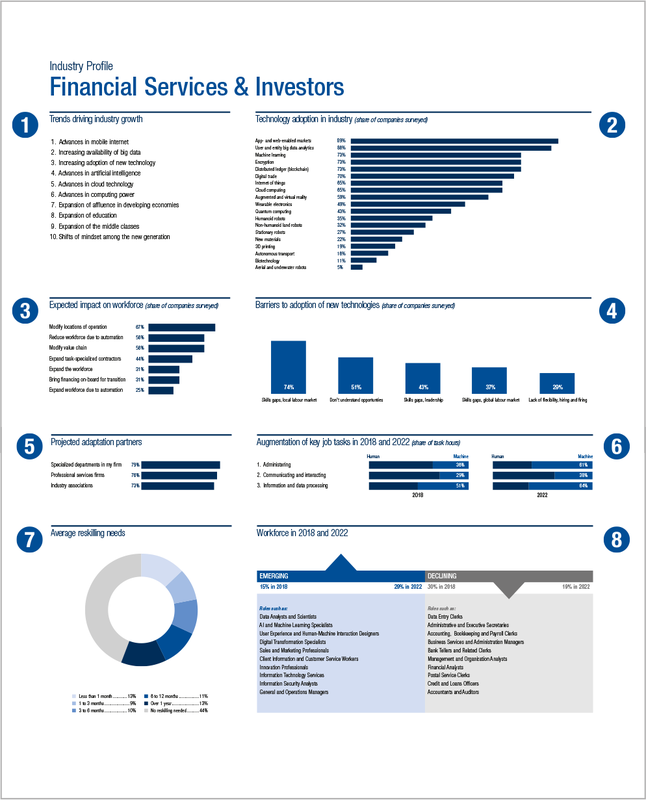 The first section of each Industry Profile provides an overview of the top socio-economic trends and technological disruptions expected to positively affect the growth of the industry over the 2018–2022 period, ranked according to the share of survey respondents from the industry who selected the stated trend as one of the top drivers of growth for their industry. For a more detailed discussion of each trend, please refer to the Strategic Drivers of New Business Models section in Part 1 of the report. The bar chart represents the share of survey respondents from the industry who indicated that, by 2022, their company was “likely” or “very likely” (on a 5-point scale) to have adopted the stated technology as part of its growth strategy. For a more detailed discussion of each technology, please refer to the section Strategic Drivers of New Business Models section in Part 1 of the report. This bar chart represents the share of survey respondents from the industry who expect their company to have adopted the stated measure(s) over the 2018–2022 period as part of their current growth strategy. For a more detailed discussion of each measure, please refer to the The 2022 Jobs Landscape section in Part 1 of the report. This bar chart represents the five biggest perceived barriers to adopting new technologies across the industry, as measured by the share of survey respondents from the industry who selected the stated obstacle as one of the top impediments to successful new technology adoption faced by their company. The data featured in the Industry Profile represents additional supplementary information beyond the high-level overview provided in Part 1 of the report. The bar chart in the first section of the second page of the Industry Profile represents the share of survey respondents from the industry who indicated that their company was “likely” or “very likely” (on a 5-point scale) to collaborate with the stated partner entity over the 2018–2022 period to develop measures and strategies for adaptation to the trends and disruptions expected to affect the industry. For a more detailed discussion of adaptation partner collaboration intentions, please refer to the The Reskilling Imperative section in Part 1 of the report. Bar charts in this section represent the expected evolution of human-machine collaboration over the 2018–2022 period across the industry. The column labels on the left-hand side of the section report the three most common job tasks, in terms of total task hours, performed across the totality of jobs in the industry. The 2018 column reports the total share of task hours contributed to the achievement of the job task by human workers on the one hand, and by machines or algorithms on the other. For example, if the respective shares were 75% and 25%, respectively, for every hour spent on performing the task in the industry, 45 minutes would have been expended by human workers and 15 minutes by machines or algorithms. The 2022 column reports the expected evolution of this human-machine division of labour across the industry by the stated year. Note that the diagrams measure the relative change in contribution by human workers and machines, not the absolute underlying number of task hours—meaning that there is no “zero-sum” competition between the two. For example, a reduction in the relative share of task hours contributed to a specific task by human workers could be entirely due to increased machine productivity over the 2018–2022 period, rather than a reduction in the absolute number of work hours spent on the task by human workers. For a more detailed discussion of this issue, please refer to the From Automation to Augmentation section in Part 1 of the report. This section highlights the expected reskilling needs over the 2018–2022 period across the industry. The diagram represents the distribution of the industry workforce according to the expected average timeframe required to retrain or upskill affected workers—either in order to equip the industry’s workforce with the skills needed to seize new opportunities created by the trends and disruptions expected to affect the industry, or in order to avoid losing competitiveness due to the obsolescence of the workforce’s existing skillsets. For a more detailed discussion of expected reskilling needs, please refer to the The Reskilling Imperative section in Part 1 of the report. This table provides an overview of expected developments in the industry-specific job roles most frequently mentioned by survey respondents from the industry. The blue column highlights emerging job roles for the industry in question and indicates their expected total employment share within the industry workforce in 2018 and 2022. Analogously, the grey column highlights declining job roles for the industry in question and indicates their expected total employment share within the industry workforce in 2018 and 2022. The individual job roles listed underneath each category are for illustrative purposes and report the job roles most frequently cited by survey respondents from the industry. Categorization of job roles is adapted from the O*NET labour market information system (please see Appendix A: Report Methodology for details). The first section of each Country/Region Profile provides an overview of the factors determining job location decisions at a global level for companies operating in the country or region. On the one hand, policy-makers may use the information provided to benchmark the country on the priority factors identified by each industry to determine opportunities for the country to build up its future talent pool in a targeted manner. On the other hand, the information provided might also prove useful to evaluate the potential risk posed by new technologies and shifting comparative advantage that might affect future company and industry location decisions in relation to the country. For a more detailed discussion of this issue, please refer to the The Future of Jobs across Regions section in Part 1 of the report. This bar chart represents the share of survey respondents from companies operating in the country in question who indicated that, by 2022, their company was “likely” or “very likely” (on a 5-point scale) to have adopted the stated technology as part of its growth strategy. For a more detailed discussion of each technology, please refer to the Strategic Drivers of New Business Models section in Part 1 of the report. This table provides an overview of job roles expected to experience an increase in demand across the country over the 2018–2022 period. The individual job roles listed are for illustrative purposes and report the job roles most frequently cited by survey respondents from companies operating in the country. Categorization of job roles is adapted from the O*NET labour market information system (please see Appendix A: Report Methodology for details). The first section of the second page of the Country/Region Profile highlights the expected reskilling needs over the 2018–2022 period across the country. The diagram represents the distribution of the country’s workforce according to the expected average timeframe required to retrain or upskill affected workers—either in order to equip the country’s workforce with the skills needed to seize new opportunities created by the trends and disruptions expected to affect businesses operating in the country in question, or in order to avoid losing competitiveness due to the obsolescence of the workforce’s existing skillsets. For a more detailed discussion of expected reskilling needs, please refer to the The Reskilling Imperative section in Part 1 of the report. This stacked bar chart is a diagrammatic representation of the share of survey respondents from companies operating in the country in question who indicated that, by 2022, their company was either “likely” or “very likely” (on a 5-point scale) to have implemented the stated response measure to shifting skills needs within its industry, that their company was yet “undecided” about introducing the response measure in question, or who questioned the need for introducing the stated response measure and therefore indicated that their company was “unlikely” or “very unlikely” (on a 5-point scale) to adopt it. The stacked bars are ordered by the overall proportion of survey respondents from companies operating in the country who considered introduction of the respective response measures “likely” or “very likely”—providing a sense of the total shifting skills needs response profile across companies operating in the country. Underlying responses have been rounded and may therefore not exactly add up to 100%. For a more detailed discussion of expected reskilling response strategies, please refer to the The Reskilling Imperative section in Part 1 of the report. This table provides an outlook on the expected evolution of workforce skills demand over the 2018–2022 period across the country. 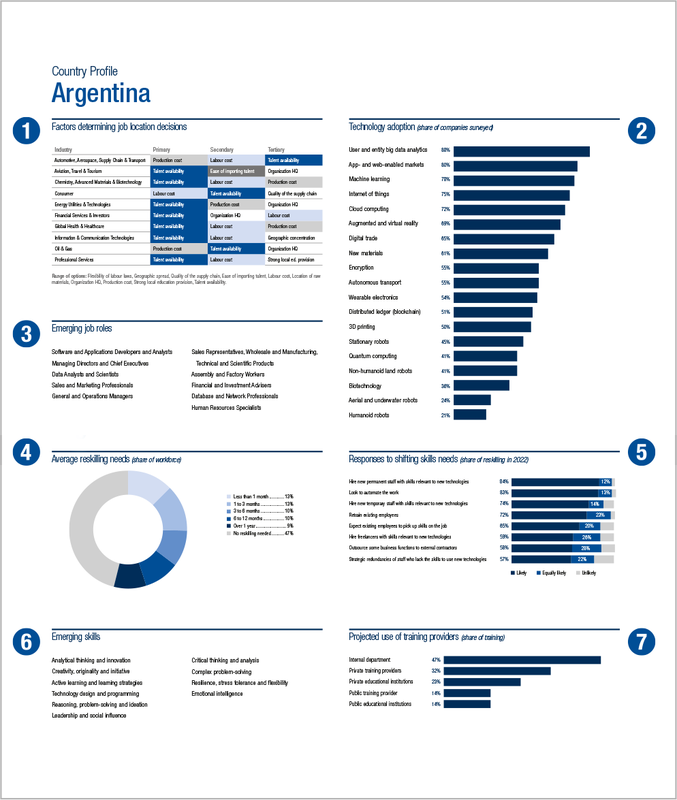 The individual skills listed are for illustrative purposes and report the skills most frequently cited by survey respondents from companies operating in the country. Categorization of skills is adapted from the O*NET labour market information system. For a detailed description of each skill, please see Table A1 in the Appendix A: Report Methodology section in v of the report. This bar chart represents the share of survey respondents from companies operating in the country who expect their company to make use of the stated education and training provider(s) over the 2018–2022 period to deliver reskilling and upskilling opportunities to their current workforce. For a more detailed discussion of companies’ retraining and upskilling intentions, please refer to The Reskilling Imperative section in Part 1 of the report.